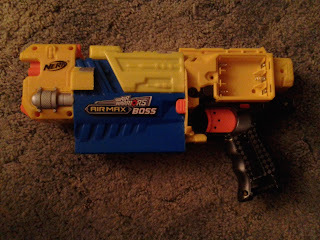 With the arrival of the Nerf Mastodon later this year, I wanted to see how well Mega darts actually hold up when used in a flywheel blaster. One small problem: no stock Mega flywheel blasters exist. And while Rival Zeus blasters have been converted into Mega blasters, I didn't want to deal with a homemade pusher mechanism or full auto just yet. 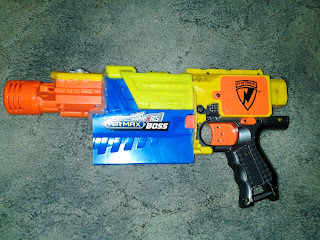 So I looked through my stack of blasters, chopped up a Barricade and BBT Air Max Boss, and made a Mega Stryfe! First things first: open up that barricade! The reason I chose this blaster was the flywheel spacing. 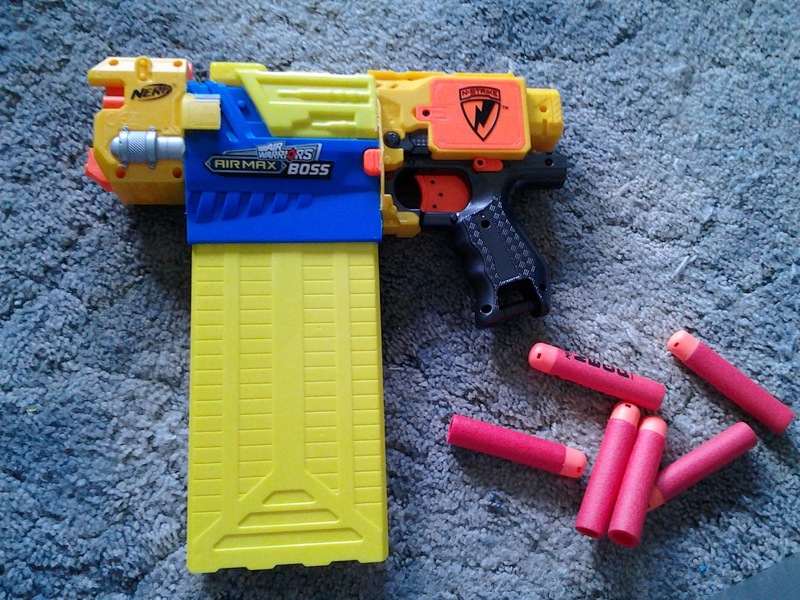 The Barricade was designed for firing micro darts with large heads (whistlers, suckers, etc). 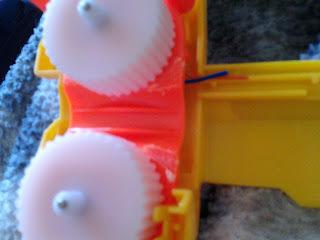 As such, it has more space between the flywheels than newer flywheel models. 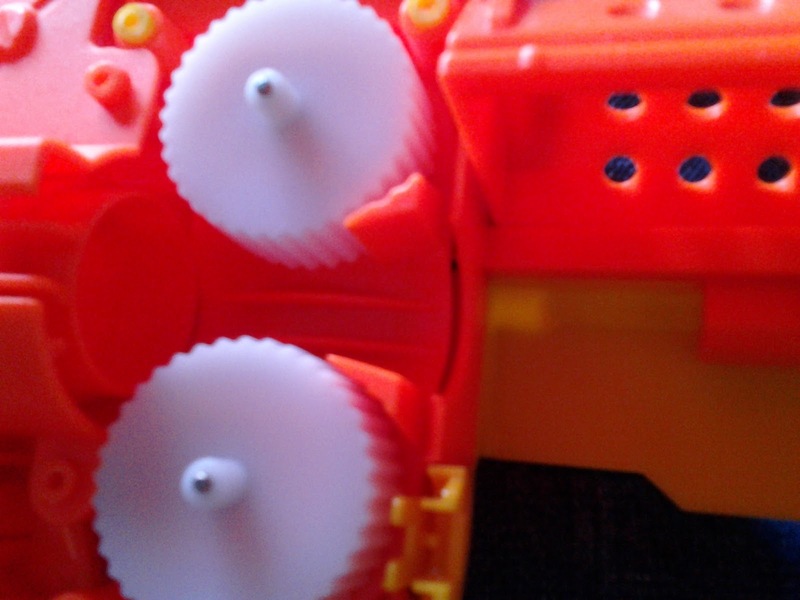 You have to cut out the dart ramps that sit in front of the flywheels, otherwise you can't squeeze Megas through. 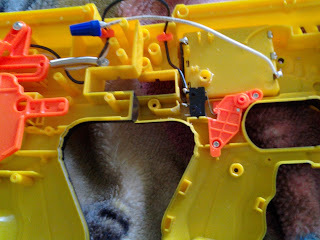 Cut your wire as needed (we will replace it), and then slice the shell into front and rear parts. The front is just the flywheel cage and decorative shell. The rear will begin at the back surface where the dart turret used to sit. This can all be done with a handsaw or dremel. 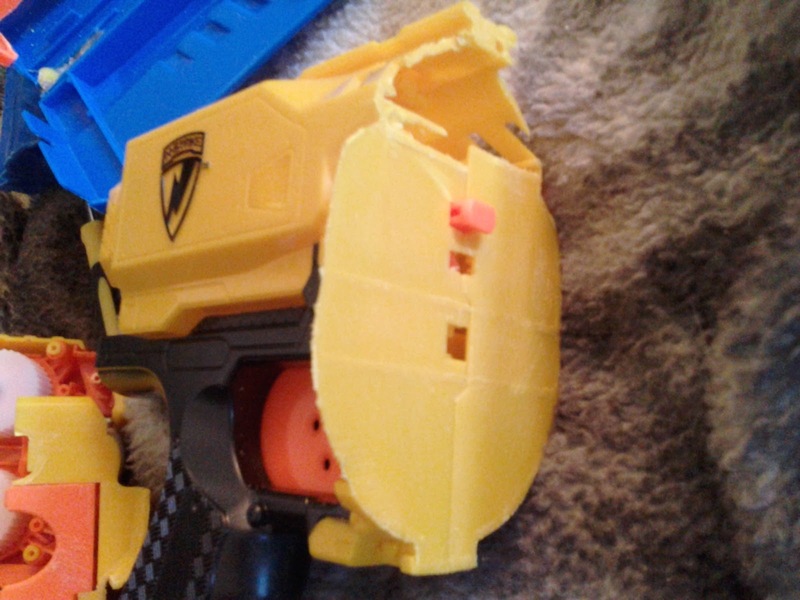 I chose to leave the tac-rail on the blaster intact. The stock switch is a tiny thin that sit under the orange plate. I threw it out, and added a 5A switch of my own that gets hit by the on/off slider. Rewire the rear with thicker wire, but leave plenty of spare wire going forward. We don't want to solder the motors, only to find out there isn't enough! For the middle of our blaster, slice the clip well out of the Boss. 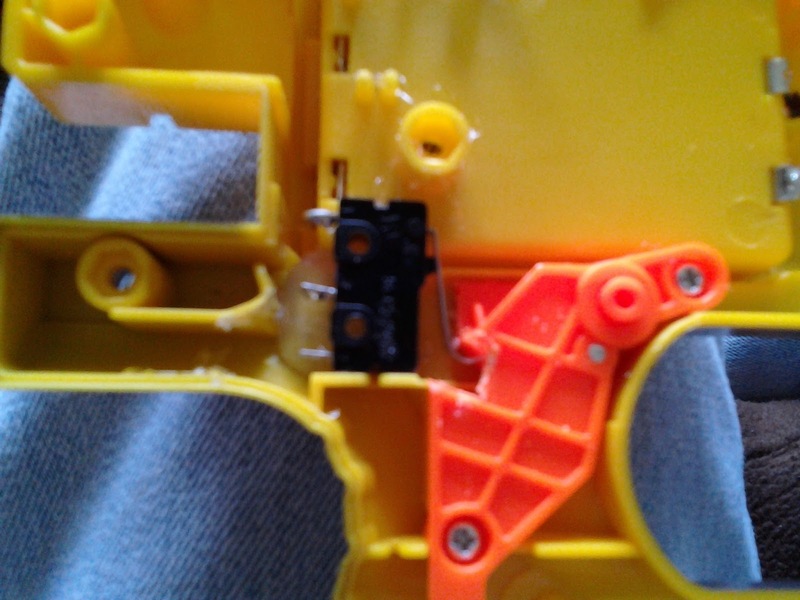 Keep in mind that doing this means the only screws you will have holding the pieces together are the ones in the yellow priming slide. 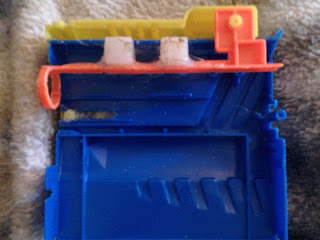 Take the Boss' bolt, and slice off most of it except for a thin strip at the top, one that can be accommodated by the lips of your Mega clips. This will act as a dart guide for feeding Megas into the flywheels. 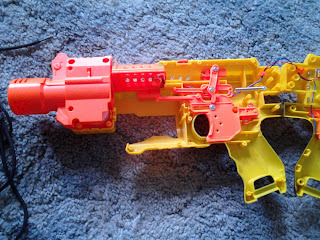 Put the guide back into the blaster, and cut off the end until it is flush with the rest of the shell. Use some kind of 1/2" spacer to secure the dart guide within the blaster. 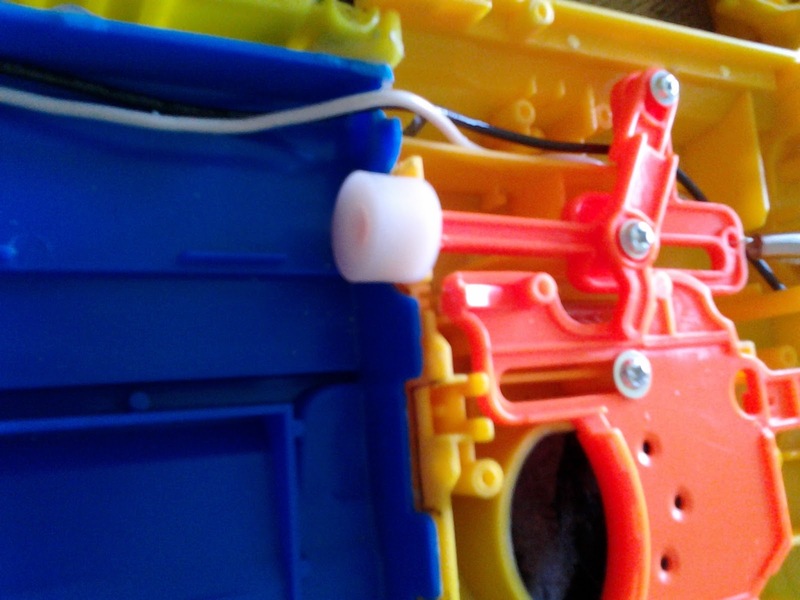 Hot glue will be sufficient. 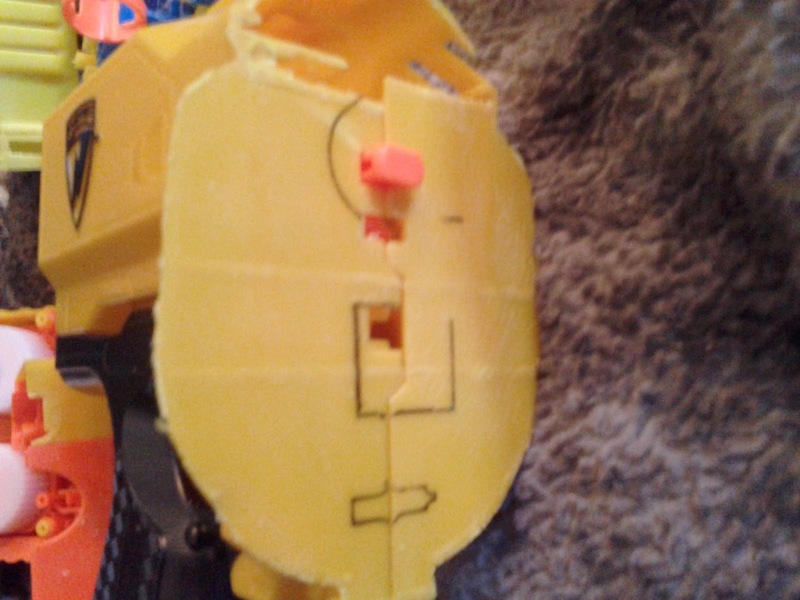 Use your Boss shell pieces to trace their positions on the Barricade shell. 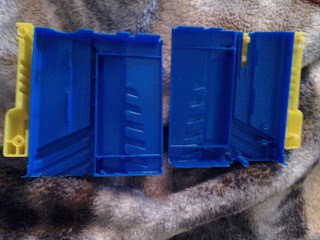 Make sure to check that A) the pusher arm goes inside the dart guide, and B) the dart guide will line up with the flywheel cage. At this point, you can use some kind of plastic adhesive to bond your shell pieces together. BUT NOT YET. I had a mistake that needed fixing that I hadn't found yet. 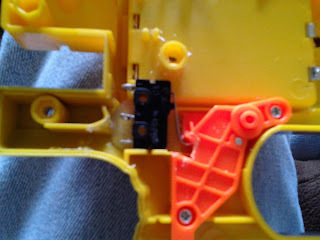 You can also cut those wires to the appropriate length for soldering to the flywheel assembly. I didn't replace the motors, and I didn't remove the small electronics board mounted to each motor. I just wanted a basic proof of concept. 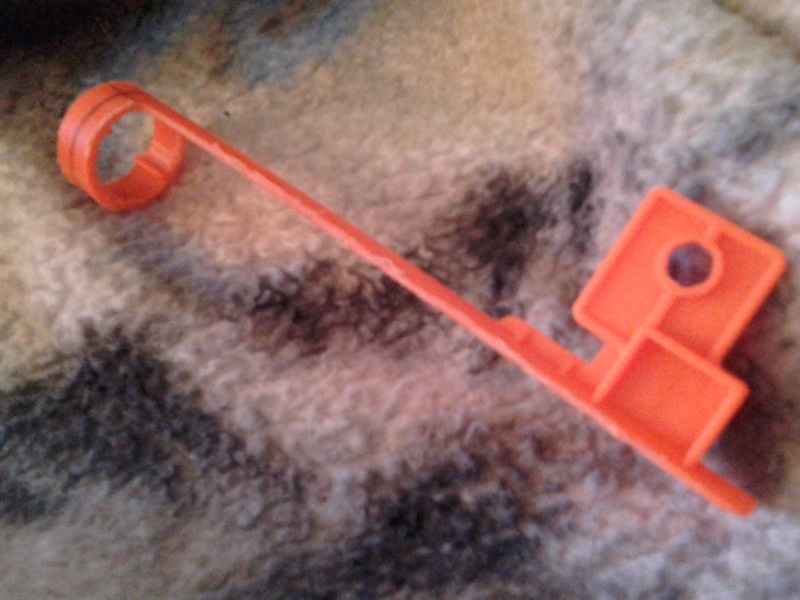 Finally, shave down the pusher arm so that you can slide some kind of space back onto it. I used a 9/16" OD nylon spacer. 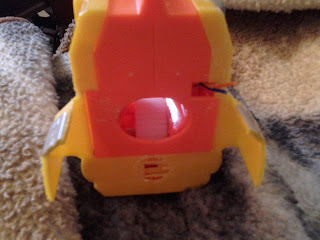 Please note that the pusher arm does NOT like up directly behind the dart in question; it is actually offset. Just in case you're having issues getting the pusher arm to properly engage! 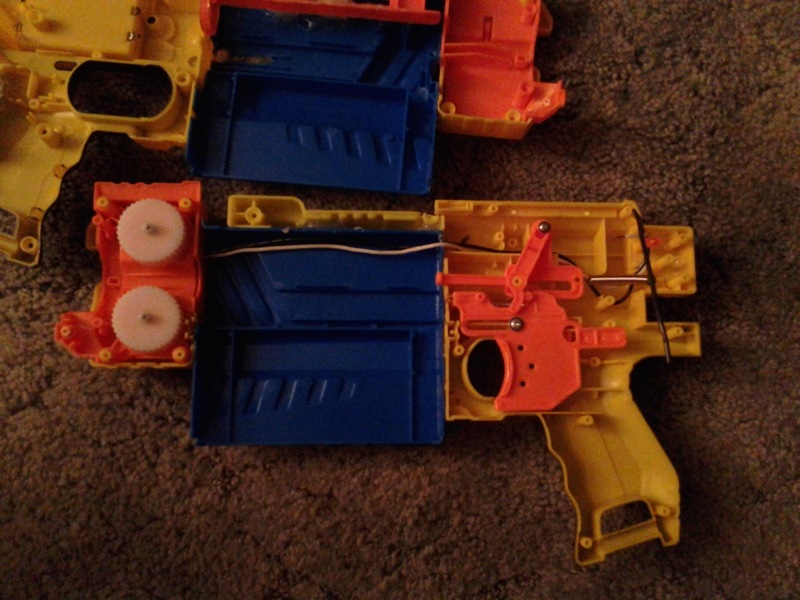 I ended up having to cut out the front of the clip well until it was flush with the inserted clip, then reorienting the flywheels so that they were horizontal. That bought me the 1/4" or so I needed to finally get the blaster to work properly. Performance with two 14500 IMR batteries was on par with that of a stock Stryfe - pretty decent, since we're firing far heavier darts. Notably, Mega streamlines do fine with flywheels, but Buzz Bee XL Distance darts either stall the motors or get destroyed on firing. The suction cup at the front simply isn't flexible enough to squeeze between the flywheels at their current spacing. This was a fun experiment! Sad that Hasbro doesn't do Mega clips anymore after the Centurion debacle. Hopefully Buzz Bee sees continued success with their Air Max blaster line, and figures out the right mechanics for firing their XL Distance darts out of flywheels! Excellent work! Thanks for seeing what both blasters are capable of and putting them both to great use. OUTSTANDING! Massive Water Blaster Inventory Update!